Spring is here! Connect 5 or more flowers to keep the garden growing and the flowers happy! More flowers grow all the time, see how long you can manage your garden! The most perfect time killer in the App Store! Just keep connecting the flowers until you run out of space! Make rows of 5 or more similar flowers in vertical, horizontal, or diagonal! You can plant flowers only if the path is not blocked by other flowers! Earn extra points from the squares with rocks! 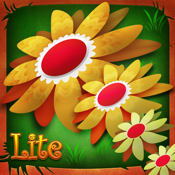 Includes soothing nature sounds on the background and simply amazing colorful flowers on green grass!